9 hours of non-stop mountain biking and hiking culminating with an ascent of Ben Venue, before finishing on the shores of Loch Katrine. Challengers arrive at the hotel at their leisure. The pie crew will be on hand for bike fitting and registration. Don’t forget to collect your goodie bag! A traditional Scottish breakfast is followed by a welcome speech and safety briefing from pie. 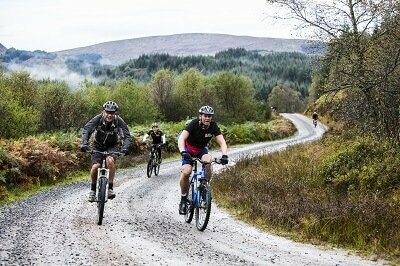 It’s then out on the bikes in your guided groups into the Loch Ard forest for some mountain biking amongst the trees, with some fantastic views as we head higher into the hills. After a quick refreshment stop at Duchray Castle, we begin to make our way towards the transition zone for lunch and to prepare for the hike. 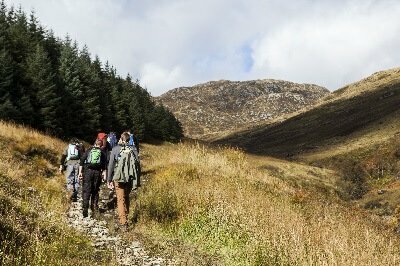 Our trek guides will take you up and over Ben Venue, before descending back down through forest to the beautiful shores of Loch Katrine. A celebratory drink awaits by the water, before hopping on a coach for the short transfer back to the hotel. The celebrations continue in the evening with a wonderful meal overlooking the spectacular Loch Ard.